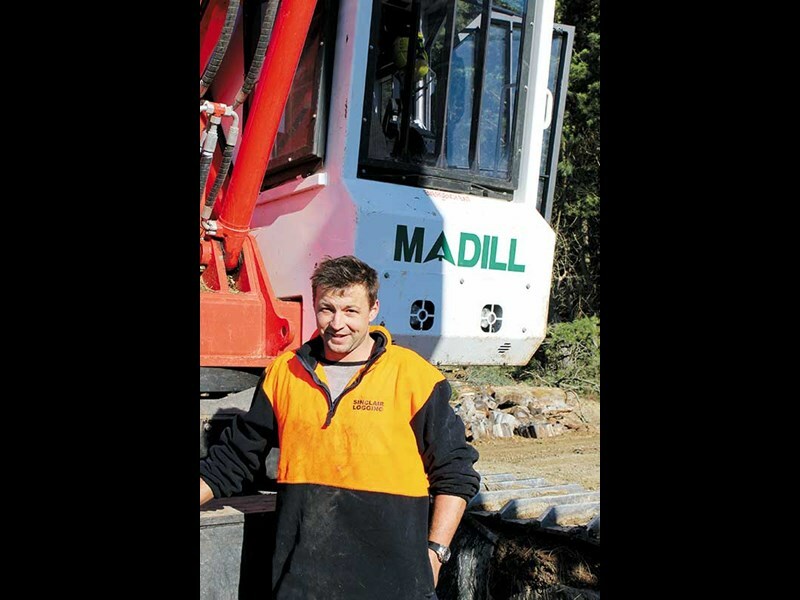 Sinclair Logging has recently invested in a reliable and rugged Madill 2250C feller buncher to work some tough Canterbury country. Cameron Officer takes a look at it on behalf of Deals on Wheels. 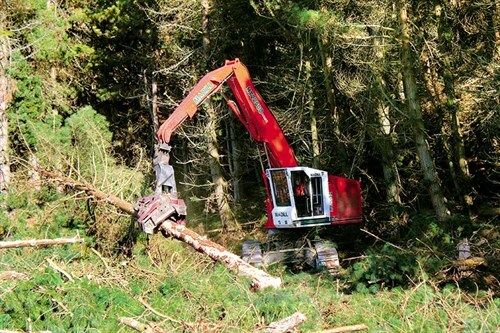 While the current downturn in the forestry industry has meant a degree of scaling back for many operators, utilising the right machines in order to work smarter has proven just as prescient a requirement. 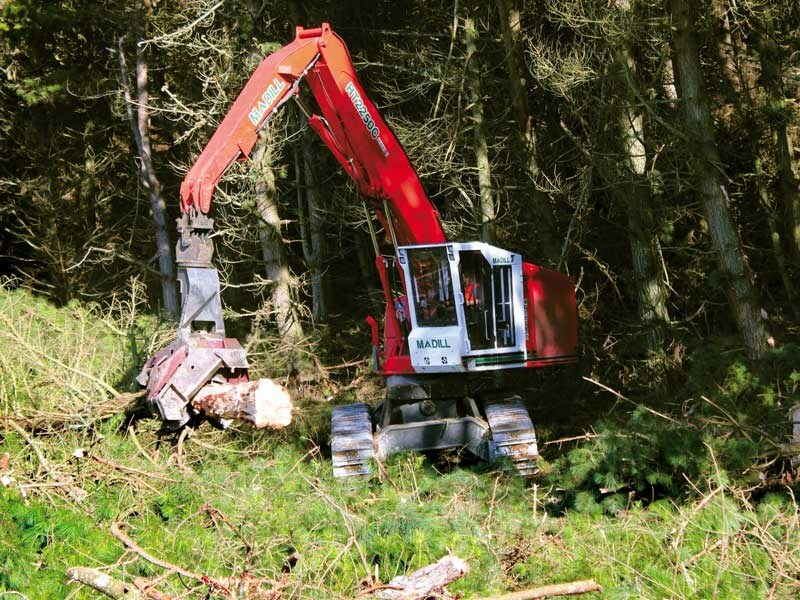 Geraldine-based Sinclair Logging, headed by Russell Sinclair, is one such company; looking to downsize the overall fleet, but upsizing specific machines in order to improve capacity and efficiency. And if you were to search the phrase ‘upsize’ in the dictionary, we’re pretty sure a picture of Sinclair Logging’s new Madill 2250C feller buncher would work well as a fair description. Arriving on-site at the company’s current block about 40 minutes southwest of Timaru, the 2250C is hard at work with operator Jake Wynn at the controls. Tidying up a skid site 50m or so away from our vantage point, there’s little to reference the Madill against. It’s not until your mind’s eye recalibrates, taking in the size of the trees its felling and the steep slope beyond that you realise this is one heavyweight machine. Remarkably the 2250C is actually the smallest in Madill’s line-up. 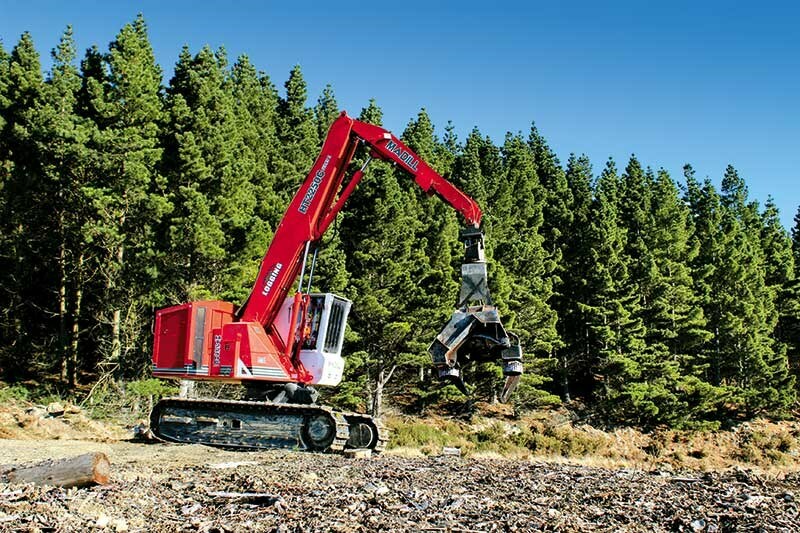 Weighing in at over 30 tonne (or 36 tonne at tilt), with a lift capacity of 8.3 tonne at six metres and a full reach of almost nine metres, the 2250C is a true forest giant. It was first engineered for the endless green of the Pacific Northwest and last year distributor Porter Equipment (which now boasts a growing footprint in the US market) announced its intention to sell and support this iconic North American brand here in New Zealand. 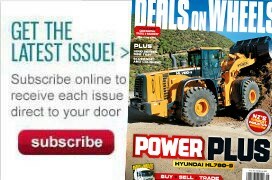 Already Porter Equipment customers – with a handful of dependable Hyundai excavators on the fleet – Sinclair Logging was interested in the potential Madill’s machines might offer their operation as soon as the Hamilton-headquartered distributor announced its plans. "We’ve always been mechanised as a company, but we’re always looking to improve on what we’re running. The idea is to opt for machines that do more," says Sinclair. "The Madill impressed us from the get-go. It’s built like a Sherman tank, but as a result it should give us many years service." 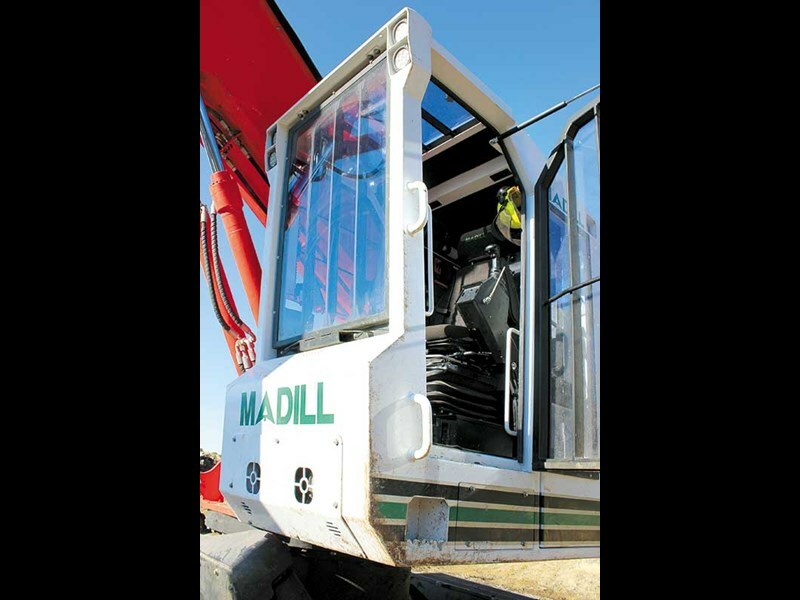 Sinclair says he’s been impressed with the power of the machine, especially its track power for climbing and the reserves of grunt the Madill exhibits in running the large SATCO 325M processing head. The levelling capabilities of the Madill are clearly also a huge benefit to this operation working in tough country that features some big gullies and steep drop-offs. In fact, Russell says the company will be looking to site a cable hauler and grapple on this block eventually to support the Madill. 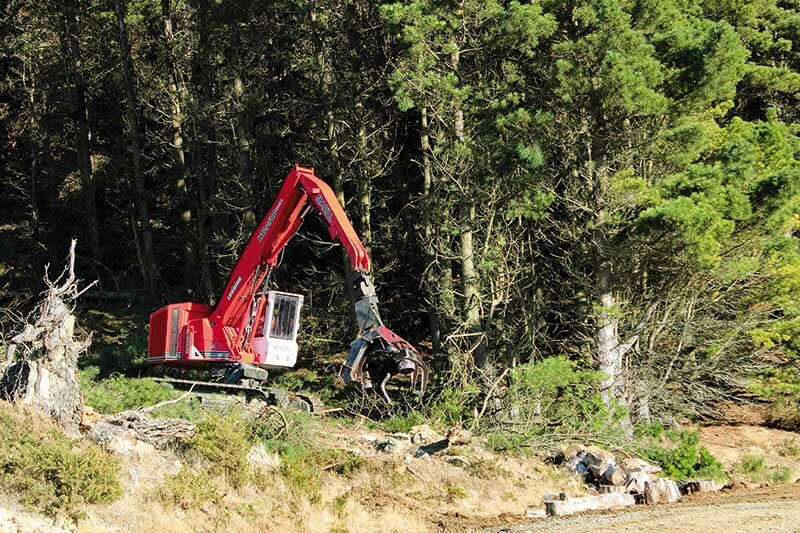 "Our excavators can do everything he’s doing on the skid, but once he starts poking his nose up the hill, that’s where the Madill comes into its own," says Sinclair, referring to the tidy-up work Jake and his machine are undertaking when we first arrive onsite. Operator Jake Wynn says Madill’s 44-inch cab provides for a surprisingly quiet environment, with air suspended seating and powerful heater and air conditioning units. 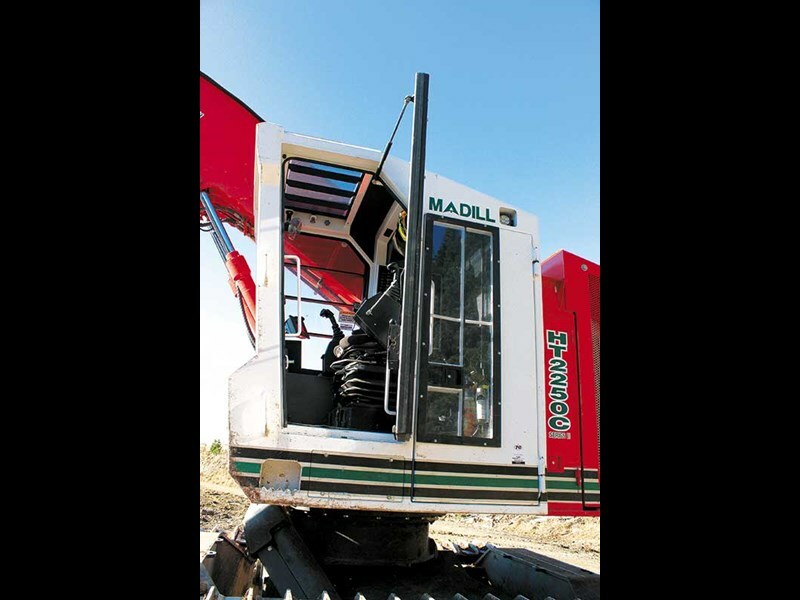 ROPS and FOPS protection measures are engineered right into the cab structure itself and the combination of Madill’s bronze tint Lexan skylight and Marguard front and side windows offer plenty of outward forward and side vision. "The Madill stuff has looked the same for decades. But it’s actually a pretty ingenious design; if you open up that one-piece engine housing you won’t find any pine needles or other debris in there. Thanks to the shape of it and the gutter system on the housing, everything slides right off." "The way the Madill is built; I think it will definitely last the distance," concludes Sinclair. "The current climate makes investing in gear like this a hard call, but I’m confident we’ll be ahead of the curve once things pick up again. This machine looks pretty basic, but actually it’s future-proofing our operation."